Q. 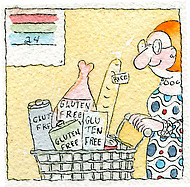 Other than celiac disease, is there any reason to avoid gluten in the diet? A. “Though the hype continues on gluten-free diets being the panacea for all ills, science still lags behind in concrete evidence supporting this belief,” said Dr. Vandana Nehra, a gastroenterologist who specializes in celiac disease at the Mayo Clinic in Rochester, Minn.